The Angelina California King Bedroom Group by Crown Mark at Household Furniture in the El Paso & Horizon City, TX area. Product availability may vary. Contact us for the most current availability on this product. Glamorous and traditional, this collection is a must have for anyone looking to add some sparkle to their bedroom. 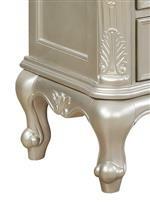 Details such as acanthus leaf molding add timeless appeal to these pieces. Other features such as the metallic silver finish bring a glam update to this collection. The Angelina collection is a great option if you are looking for Glam Traditional furniture in the El Paso & Horizon City, TX area. 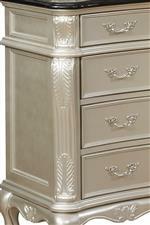 Browse other items in the Angelina collection from Household Furniture in the El Paso & Horizon City, TX area.